Drain valve in bulkhead (aka tank adapter) fitting. This one is different from the other drain valves and may work better for some people. 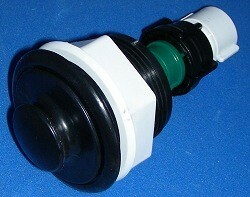 The bulkhead (aka tank adapter) is mounted in the cabinet or enclosure. Into the bulkhead fitting fits a cage with a handle which has attached to it a 3/4 garden hose valve. Attached to it is a 3/4" slip socket Adapter. (But you can use anything that has a male garden hose fitting or threads on the end. The adapter that comes with it has a 3/4 slip socket to glue on to 3/4 flexible pvc pipe (some call it FlexPVC&REG;). (.75" ID/1.05"OD)) How it works is this: You pull out the handle which allows you to pull out the hose from under the enclosure and you turn on the valve which allows the water to flow. You can extend it as far as you have hose under the enclosure. When done, you feed the hose back into the enclosure through the bulkhead (aka tank adapter) fitting, turn off the valve and snap it back in place. The bulkhead fitting requires a 2-5/8" to 2-3/4" hole.